The Ronja Huon, our state-of-the-art well boat is the first vessel of her type in the world. 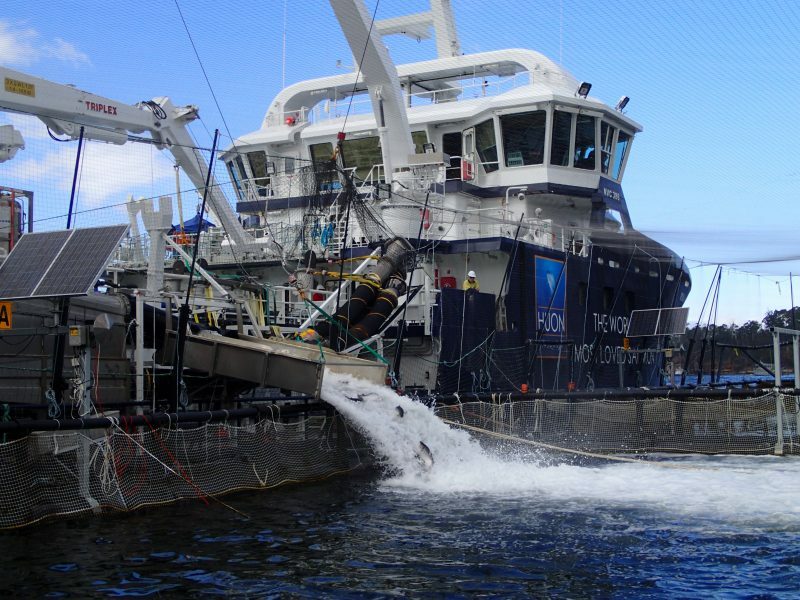 The Ronja Huon is used for several purposes including bathing fish in freshwater, transporting fish to harvest and smolt (juvenile salmon) to sea. Ronja Storm, our new well boat is currently being built in Norway and when completed, will measure 116 meters, have the capacity to bathe an entire 240 meter Fortress Pen, and will have an on-board desalination system. Tasmania is a unique environment when it comes to salmon farming. Amoeba are native to Tasmania and are a single celled microscopic organism that has affected our salmon since the beginning of our industry. The Amoeba multiply and reduce water flow at the gill surface that can limit oxygen supply to the fish causing lethargy and, if untreated, death. Because Amoeba are a marine parasite and can’t tolerate being in freshwater, whereas salmon can adapt to going between salt and fresh, bathing fish in fresh water cures the salmon of amoeba. Huon is the first company globally to use a well-boat for the purpose of bathing fish in freshwater. What this means is that rather than needing to tow large liners full of freshwater, fish are transferred into the wells of the boat to swim around for a few hours before they are returned back to a pen. Where freshwater liners only provide single use of freshwater before it is released back into the sea, a well-boat can clean and reuse the same supply of water up to six times. This has a significant impact on our freshwater efficiency for marine farming. It makes the process of bathing and transporting fish far less stressful, is a safer working platform for workers undertaking bathing operations during adverse weather and reduces the need for higher numbers of smaller, noisier vessels to be moving around the waterways. By transporting all fish in an enclosed system that can be sterilised, the potential for disease transfer is reduced. When smolt are ready to go to sea or fish ready for harvest, they are transported in the Ronja Huon’s specially-built hull. Transporting fish this way rather than the traditional method of towing pens full of fish, reduces the potential for disease transfer, fish escapes and the fish are safe were they can be monitored on video screens.